What is the common feature of The Chaser, The Yellow Sea, The Scam, and Confession of Murder? It is the script editor: HONG Won-chan. Ever since he started his film career as the script editor of The Chaser, he has constantly pursued the thriller genre and with his directorial debut Office, he made it to Cannes Film Festival's Midnight Screening section and had the privilege of walking the red carpet with Natalie Portman. 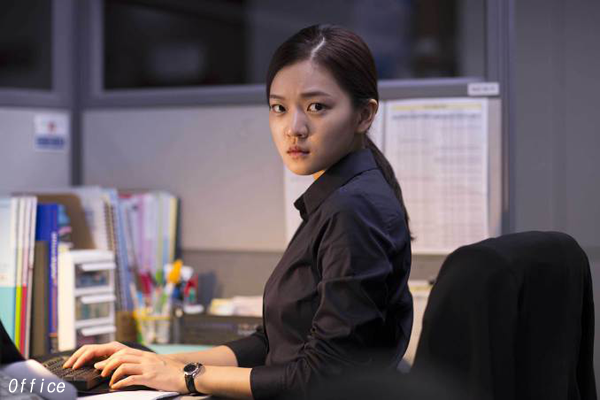 Released on 3 Sept., Office is quite a realistic thriller. An employee who had murdered an entire family is somehow back to work, and the film traces what happened to his co-workers afterwards from a detective’s perspective, in a tug-of-war with the audience. The film gradually discovers the hell-like features of the office. 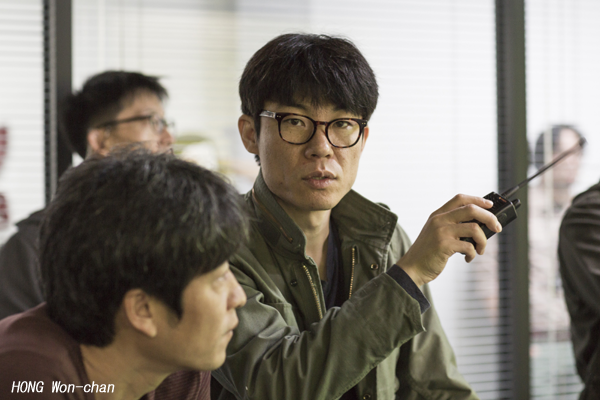 A devoted fan of thriller himself, HONG tries to explore a different path in Korean cinema where, in his opinion, all the genre films are too generic. That is why he had refused to make a typical story of a detective going after a killer. Although Office might receive mixed reviews from its audience, HONG is resolute to pursue his own way. In Office, balancing out between thriller and horror must have been very important. I learned from my writing experience that the rhythm is especially important in feature films. Not just in the thriller genre. I am most concerned about creating the rhythm that keeps the two-hour story in the loop of tension, relaxation and then climax. Office has a touch of horror, but as a whole, it is more a realistic thriller. I have written many thriller scenarios but I am not so much a fan of those bloody, provocative scenes. So I tried to think of alternative expressions: something that is not too disturbing for the audience but still realistic. You seem to have worked hard for realistic illustrations in Office, how you depicted the inside of the office is one example. I guess that is me. The more I shoot, the more realistic I wanted to go. In fact, I took away a lot of details and elements that were more fit with fantasy or horror. You know, the whole setting and atmosphere are more important than logical explanation in horror films. As a result, the audience seemed to adopt a more rational approach. Still, some say Office lacks probability and it needs more explanation. I feel that some may find it a bit unkind. Was the response at Cannes somewhat different from what you received at home? Cannes' response was favorable in general. They seemed to enjoy the film more. It may have to do with the Midnight Screening section which attracts genre lovers. They enjoyed the generic elements like suspense, but also understood the elements of social drama. On the contrary, Korean viewers seemed to expect something more clear-cut and catharsis-tic. The climax of Office takes place in the later half where the main character, Mi-rye (played by KO Asung) who is an intern staff, shows an abrupt change. Did your audiences respond differently? They showed different responses, majorly depending on the level of their understanding of the genre. I wanted them to enjoy it in a more cinematic way. For example, films like Carrie massively blow up the audience in the later half. I believed that it was the right plot for films in this genre. That might be the game-changing feature that can be found in genre films. Did you confront any negative responses during production? It was already there in the scenario. I had no conflict with CHOI Yun-jin, CEO of the production house Film Blossom, who also wrote the scenario. However, I had to persuade some of the investors who were not comfortable with it. Thriller films in Korea usually have this common structure where either the good guy wins or the macho male character defeats the evil. For the audience, Office might look strange. However, I am sorry that Korean thrillers are still confined within such repetitious formulae. The majority of them still have serial killers and revenge motives. If you ask me, I would say that I am rather tired of the serial killer stories. As a devoted fan of the genre, I really feel sorry about that. I wish to see more of original and diverse thrillers and genre films. As a social drama, Office also criticizes violence in Korean society. The genre’s frame is of course important, but within that frame, I also want to stick to the story that I want to tell as well as reflecting the social elements. As I set Office mostly in an office from its script stage, I had to reflect the temporality of our time. While Whispering Corridors depicted the hell of viciously keen competition at high schools in Korea in the genre’s own suspense, Office depicts the hell of workplaces. At Cannes, the audience enjoyed those moments. They would ask if offices in Korea are really like that, and how they can do possibly exact such verbal violence to juniors at work. Usually outsiders cast more curious glances. On the other hand, Korean audiences were much more straightforward, probably because it is their own story. I wish many office workers would watch the film and show responses. Let us talk about the actors. The performance of the supporting actors who played Mi-rye’s co-workers was efficient. Unlike in other films, even supporting roles have their own scenes in Office. They are not just supporting, so I put a lot of efforts in casting. The bottom line was not to cast star entertainers. I needed professional actors who are not exaggerating, but have a realistic tone to their acting. I like those actors with their own way of speaking. When I saw LEE Chae-eun in Tabloid Truth, I knew she was the one for the role. KIM Eui-sung has an annoyed look on his face. (laughs) He is a pleasant man who is fun to be with, but has the kind of ennui that those who really know life have. And I liked RYU Hyun-Kyung’s characteristic indifference on her face. O Dae-hwan and PARK Jung-min also did a good job for their scenes. I was very grateful that PARK Sung-woong accepted a supporting role, which I didn’t expect. I guess we might as well call Office a KO Asung film. I don’t say this often, but I’ll say it now because it is over. (laughs) She must be a genius. That’s why I had to cut complements to minimum while we were shooting. I wanted to keep her in tension. Now I regret that I could have made her more comfortable. She is doing great as an actress, and it will be just wonderful if she well self-administers to grow up into a good person as well. You stepped in the film industry as the script editor of The Chaser. Your directing debut is rather late. NA Hong-jin and I are fellow filmmakers at the Mise-en-scène Short Film Festival as we submitted our films in the same year. After graduating film school I monitored his scenario for The Chaser which I liked, and I agreed to edit it for him. Since my debut was successful, I didn’t have to come a winding road, but I did not want to rush my directing debut. Your next film is a thriller, too? I am a big fan of hard boiled and thriller genres. I have a wish to make a TV drama series of these genres, like those American TV dramas. In TV dramas, I could deliver long, interesting stories that films cannot contain. Whether TV shows or films, I wish to see thrillers with a variety of subject matters, and I am thinking of two or three themes for my next film, but I don’t want to rush. It will still be an intense thriller for sure.